Mindful Work: A growing number of leading businesspeople open meditate. They may have been meditators for a long time, but now they are not shy about saying that they meditate. The late Steve Jobs of Apple is one of the best known, but Yves Chouinard of Patagonia, and Eileen Fisher of the eponymous fashion brand, led startups that grew into successful large businesses. They and countless others have ‘come off the cushion’ and been open about their mindfulness practices. Why would they do that? Not just because they achieve personal awareness, but also because they have witnessed the positive consequences in others at work. Managers in general, and entrepreneurs in particular, confront hardship and stress. There are multiple reasons for startup failure and I suggest, that hardship and stress is a significant reason why half of all startups fail in the first five years. Perhaps successful startups, on the other hand, have founders who are more resilient and better able to ‘be in the moment’, as meditators say. Big companies are into meditation, too. Not just the Silicon Valley ones either: General Mills, P&G, Aetna, Target and Ford are among them. Being awake to small things and coping with failure enable all those things that entrepreneurs are supposed to be good at. Not only do they need to be resilient, but they also have to be ready and able to deal with contradictions, pivot and start over,. They must deal with risk as well as opportunity. Mindful work, through meditation, helps them to both spot opportunities and notice potential risks. My mentor, Jeffry Timmons, called entrepreneurship a ‘full contact sport’, where value is created by the collision of spontaneity and opportunism, with discipline and process. How do you achieve that full contact if you are not fully awake and living (and working) in the present moment? Fear of failure will probably keep you from ever starting a venture. But you cannot simply decide to overcome a fear of failure, it’s necessary to develop skills and a state of mind that allows confronting the fears, calculating the risks, and then deciding. The driver is probably a great need for achievement and self-mastery, even as you quake in your boots. That does not mean being foolhardy, since uncertainty will remain, but it is likely that the successful entrepreneur is a consummate learner, who is predisposed to action on the basis of lessons learned. 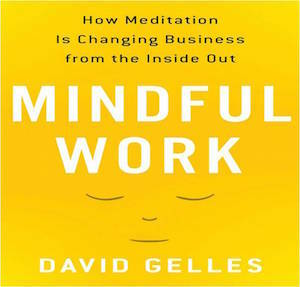 Mindful Work: How Meditation is Changing Business from the Inside Out, a book by David Gelles, a New York Times business reporter, describes how big companies have fostered mindfulness practice at all levels of the business. Himself a meditator for many years, the author demonstrates how mindfulness both lowers stress and increases focus. Gelles does not come at mindful work from a spiritual perspective, notwithstanding the spirituality of many meditation practitioners. Rather, he shows the practical ways in which both individuals and companies have benefited from mindfulness. He also documents the conclusive research of people like Richard Davidson at the Center for Investigating Healthy Minds at the University of Wisconsin/Madison. A brilliantly well-written book, Mindful Work, should be on the reading list of any serious manager, but even more so on the list for every entrepreneur, given the horrendous pace at which most of them work. Most entrepreneurs I know, myself included, tend to rush headlong to fulfill their dreams, which is strange, given how hard it is to turn passion into reality. One of the problems we face as entrepreneurs, is that we are never still and that restlessness can itself be what trips us up, mindlessly. Until I started (Insight) Meditation, I had never stopped to reflect upon the fact that the only thing relentless in my life is breathing. In one sense, nothing but breathing matters. For Mindful Work, Notice Your Breath! Noticing the breath takes stillness and practice. It’s a matter of focusing on the present, rather than the way our monkey-minds drive us to be thinking about the past or the future, especially suffering. When we are on the cushion we do not consider our past breaths, or the ones we are about to take. We notice each individual breath, as we take it: the in-breath, the slight pause, and then the out-breath. Of course, our thoughts continue to bombard us, but it takes repetitious concentration to let them arise and fall away without paying them attention and getting distracted from the present. When I started, I wondered why our teachers so often had us do what are called ‘body scans’. Noticing each part of our bodies one after the other helps us to be aware of each part that we normally never perceive. How often do we ever pay attention to each hand separately, no less each of our ten fingers and thumbs. With practice, we get (very slowly) better at it. So what’s the connection between that body scan and resilience for the entrepreneur? Staying in the moment helps us get out of the brain’s amygdala (flight or fight mechanism) into the pre-frontal cortex where decision making and social behavior take place. For a little help on concentration and focusing on your breathing, here is some.